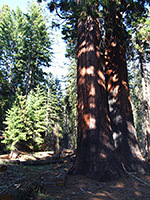 West of the General Grant Tree in the Grant Grove section of Kings Canyon National Park, the land slopes down quite steeply, and the giant sequoia are soon replaced by mixed woodland of fir and pine at the lower elevations. 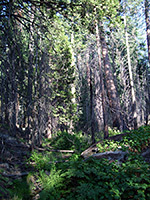 The hillsides are crossed by trails and disused logging tracks allowing for various hikes through this dense and little visited part of the forest, of which the best is a 5 mile loop that passes plenty of flourishing sequoia on the upper slopes, and also a meadow, a huge dead sequoia, an overlook of Sequoia Lake, and two pretty cascades on Sequoia Creek (Ella Falls and Viola Falls). The route is quite steep in some places, descending then climbing 900 feet, but all is quiet and peaceful, undisturbed apart from occasional vehicles traveling along some of the forest tracks, to and from several private camps around Sequoia Lake. Besides these tracks, the loop also involves all or part of three trails: North Grove, Dead Giant and Sunset. Sunset Trail and Dead Giant Trail topographic map, Grant Grove location map. 10 views along the Sunset and Dead Giant Trails. Ella Falls (mp4; 0:31 min; 6.1 mb). The hike starts at the far side of the RV parking area at the General Grant Grove, where the destination for 99% of all visitors is the short path to the General and several dozen other famous trees, just to the east; the loop hike, however, sets off to the west, and is signed as the North Grove Loop. 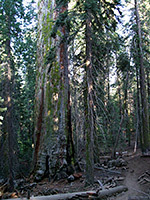 It descends gradually, through the cool, silent forest, passing just a few large sequoia amongst many smaller trees. The one mile North Grove Trail forks off to the right, after which the track moves alongside a small trickling stream fringed by ferns and other bright green plants. There are two big, burnt sequoia trunks here, one horizontal, the other still standing. The second junction with the North Grove Trail is passed on the right, followed by more giant sequoia, until the track exits the sequoia grove and moves into regular forest, soon descending to Lion Meadow, a small, moist grassy area with a decaying tree lying across. At the far side is a five way junction; left is a private path to a maintenance facility while the right two branches are the ends of the loop to Sequoia Lake Overlook and the Dead Giant. The northernmost fork climbs slightly alongside the meadow to the deceased tree - a large, headless, free-damaged sequoia - then ascends a little more into a sunny clearing at the edge of a plateau, where the trees give way to grass and bushes. A short spur leads to the overlook of Sequoia Lake, a reservoir 800 feet below and one mile south, created in 1890 to supply logging operations further down the hillside; water was transported over 50 miles via flumes and aqueducts. The lake is only partly visible from the viewpoint, being mostly hidden behind distant trees. The Dead Giant Trail next has a short descent through quite thick woods back to the forest track, which continues zig zagging down the slope for a mile to the next junction, with a busier track between Sequoia Lake (left) and Cedar Spring (right). The left road contours round the hillside and drops down to yet another junction, this time with a road around the lake - a paved route that passes quite a lot of development, all private property of the YMCA. A sign announces 'Observation Point', but Sequoia Lake hereabouts is still completely hidden by trees, and it seems that non residents are not allowed to get any closer or hike along the road, except for the very short walk eastwards to the lower end of the Sunset Trail, which forms the next section of the loop. 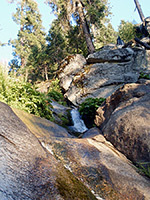 This path climbs up the bushy valley of Sequoia Creek, rising slowly at first then more steeply, up to the base of an exposed granite slope where the stream cascades down the rocks forming several pretty pools, bordered by colorful vegetation. This is Ella Falls, viewable only from beneath; the stream flows all year but the waterfall is of course a lot bigger in early summer when the snows are melting. After the falls, the path cuts northwards a way, climbs even more steeply, and crosses another drainage to a four way junction. The right path reaches the smaller Viola Falls then Hitchcock Meadow and eventually the Big Stump entrance station, while straight on is a continuation of the Sunset Trail, to Sunset Campground and Hwy 180. Bearing left, the path runs alongside a creek and across a marshy area to the end of the paved road to Swale Work Center, base for a detachment of the Arrowhead Hotshots firefighters. The 5 mile loop is completed by walking along this road back to the General Grant parking lot, past forest that once again contains a sprinkling of giant sequoia.